I know I’m not the only cheap woodworker around. Alan Noel is a self-avowed cheapskate. That means we go to the big chains, blue or orange, when we need lumber that doesn’t have to be special. Or straight. Or pretty. However, there are times we just have to put the price behind us and go to a real lumber yard where we can get good lumber, exotics and specialty items. I find such trips to be inspiring. Of course, I’m usually already a little inspired because I’m there to buy some special wood for a special project, often for a special person. Walking among the boards of white oak, red oak, walnut, cherry, quartersawn pine, ipe, and all the others just makes one’s imagination go wild. Need some inspiration? Take a trip down to your hardwood dealer or real, old-timey lumber yard. Walk through the stacks and be inspired. And, stay away from the wrong kind of lumber yard. Years ago several of us made a trip to Belize for fishing and exploring Mayan ruins. Eating was a bit of a challenge because we wanted to avoid Montezuma’s Revenge. At first, I was drinking iced tea because it had been boiled. Or Coca Cola because it was sterile. Or American beer because I assumed it had been bottled in the States. Then, it occurred to me, “All beer is sterile, even local beer made with local water.” American beer was “imported,” and I was paying a premium for it. Local beer was cheaper, and perfectly safe. Perfect combination for a cheapskate. We felt safe eating at the hotel. One day we got brave enough to stroll down the street near the hotel and found a lumber yard. Well, actually, a Lumbaa Yaaad, as the locals would say it. But, this lumber yard no longer sold wood. It had been converted to a food and drink establishment. While we were feeling brave we decided to go in and eat and drink. I Googled “Lumbaa Yaaad” + “Belize City,” and some variations, and the only hits I got were domestic, one a bar in Seattle and one an actual lumber yard. It seems our one-time watering hole no longer exists. Need some cheap inspiration? Visit your local or nearby fine wood dealer. What did the invention of the wheel mean to mankind’s development? The significance can’t be overstated. Nor can wheels’ value be overstated in the one-man woodshop. In mine, everything is on wheels. 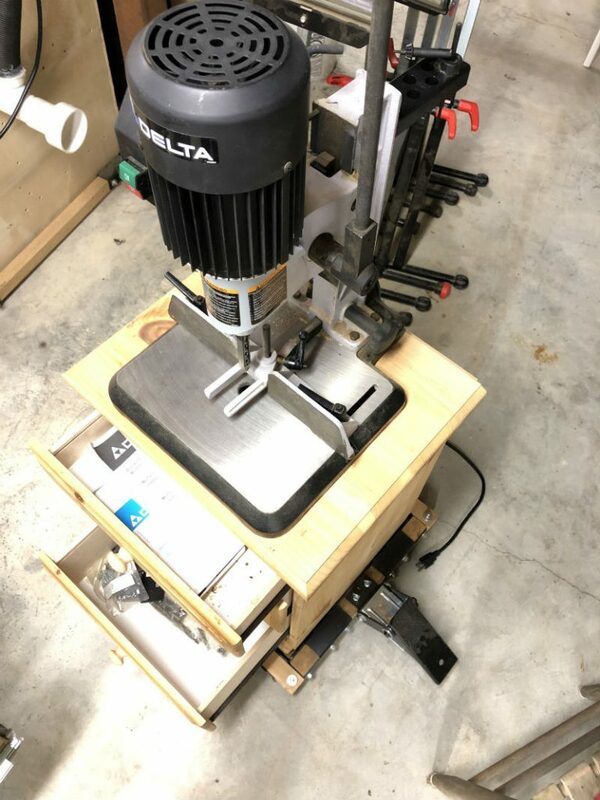 It worked out so well that I ordered my Delta jointer with the factory mobile base. 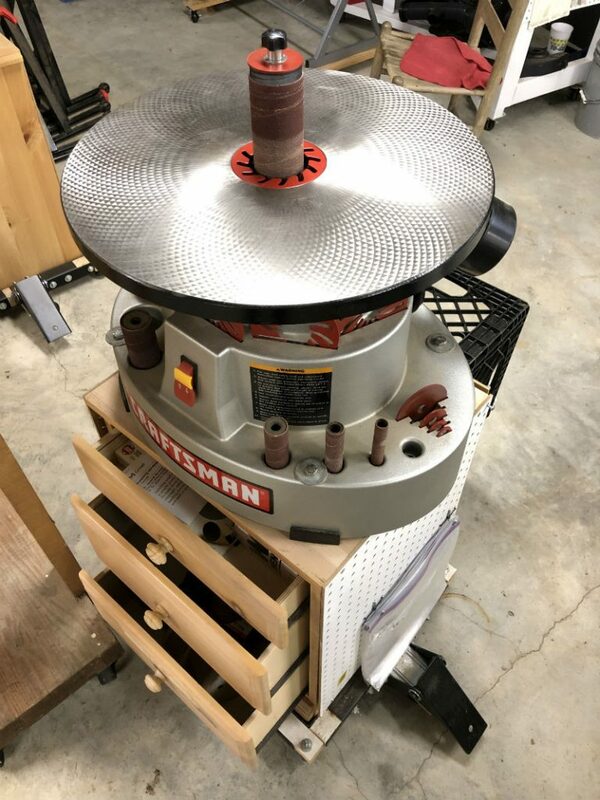 The factory Delta jointer wheeled base is a nice, custom look. 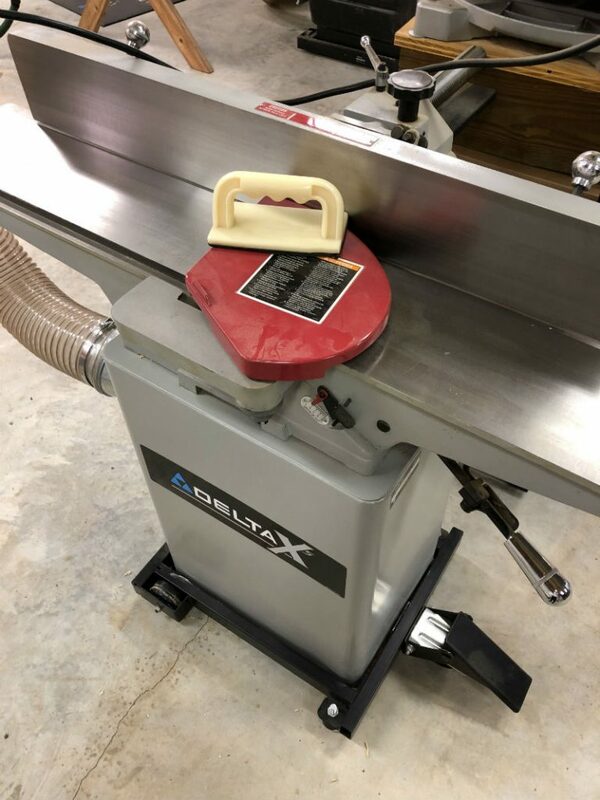 If only I’d waited and gotten the 8″ jointer! 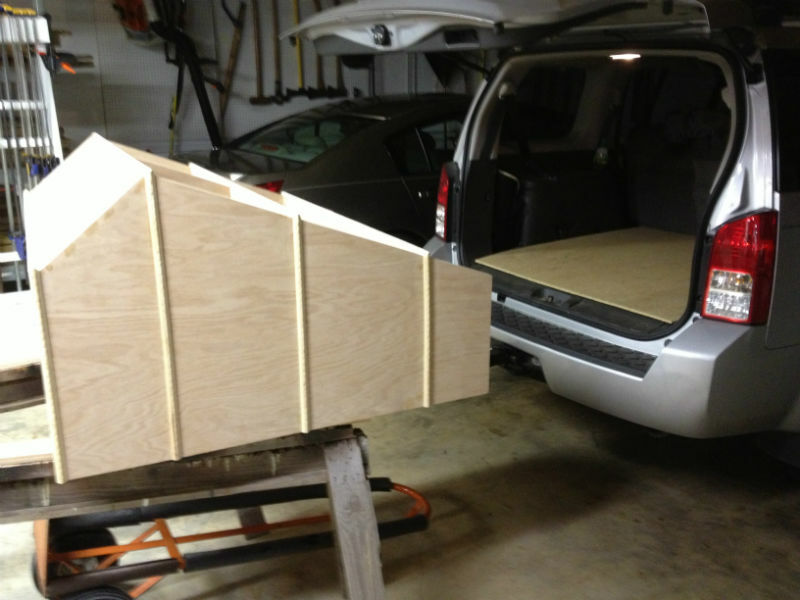 Then, when I bought a DeWalt planer I sprang for the factory base, which is really a platform. 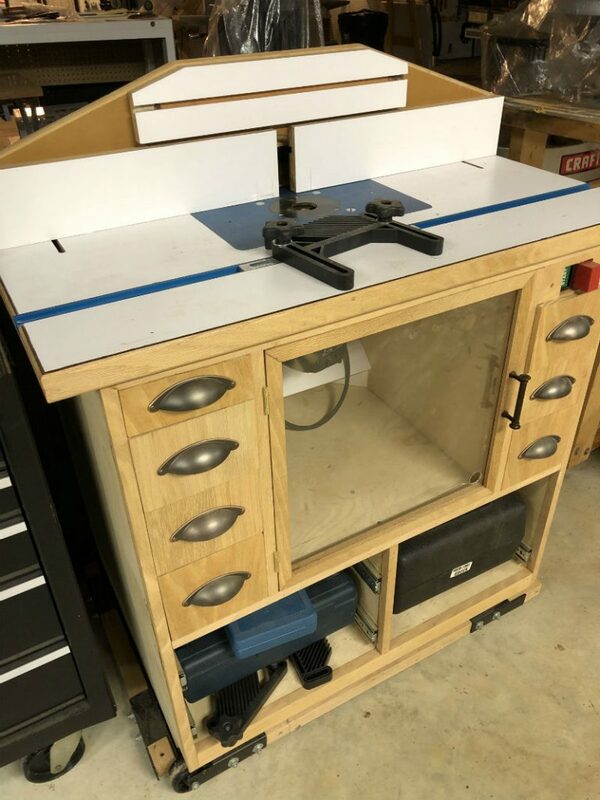 I could have started with a universal mobile base and just built a cabinet, and, if I had to do it over, I would probably do that. I’m tall, and I found that adding some height made using the planer much, much easier. I ended up adding 6 x 6s plus a sheet of 3/4″ plywood to make the height comfortable. 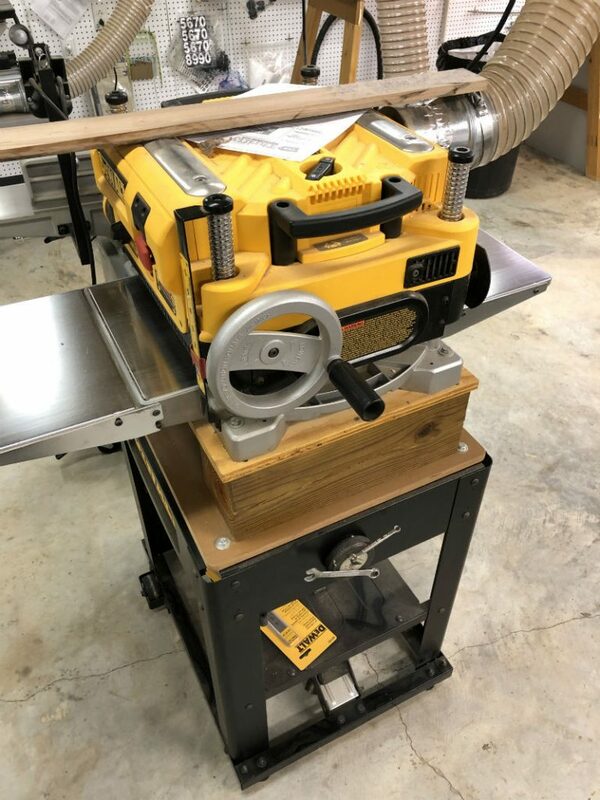 As professional and custom as the jointer base is, the DeWalt planer base was, too, until I got hold of it and began customizing it to suit my height. Click here to read the story of these bedside tables. When I delivered the new tables to the bedroom I couldn’t bring myself to put these on the burn pile, so I turned them into useful shop furniture and storage. Not pretty, just useful. The trusty Craftsman spindle sander on top, random orbit sanding disks inside, a bedside table on a universal base makes a pretty good sanding center. A mortising machine is mostly useless unless it’s immobile. 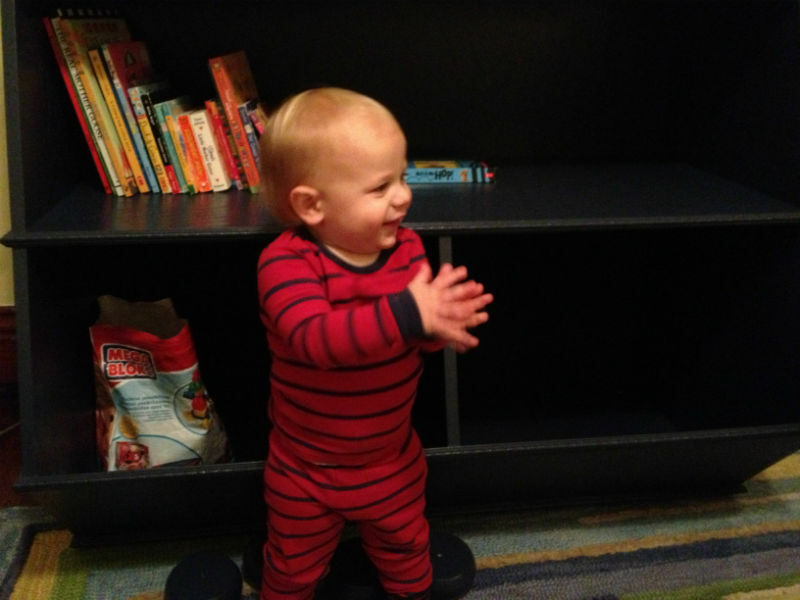 The old bedside table fills the bill and makes it portable, too. When it’s not being immobile. 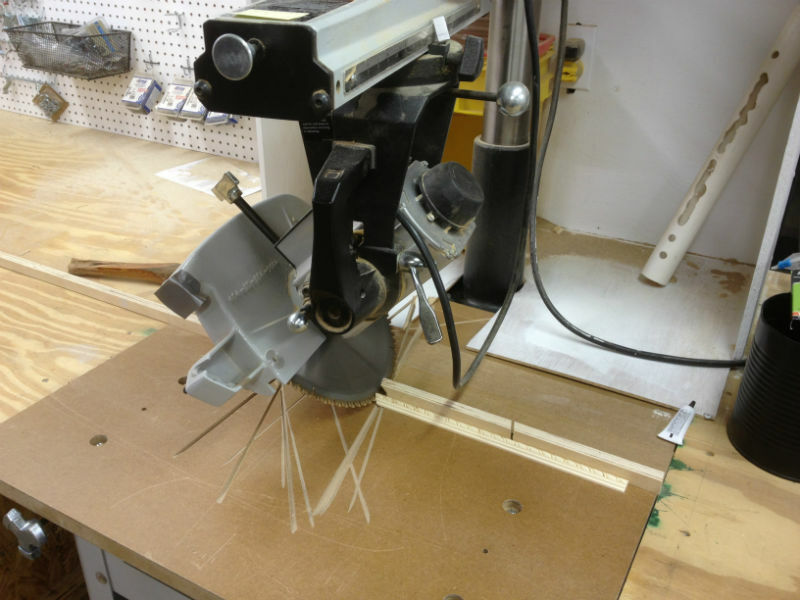 Ditto for the yet-unfinished Norm Abram Router Station. 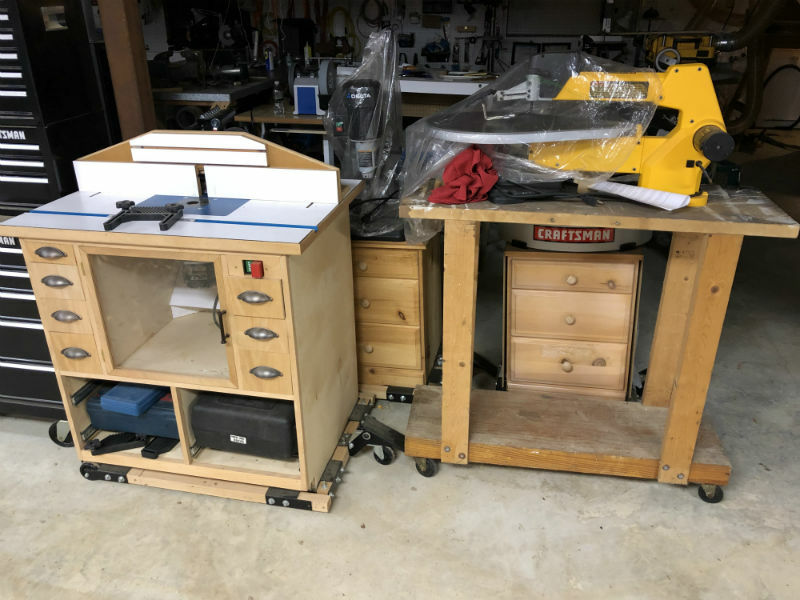 Well, I say the router station is unfinished, but, the fact is, I never made the drawers for the bottom and I probably never will, so maybe it’s as finished as it will ever be. I’ve discovered that I like being able to slide the routers, in their boxes, in and out of the bottom storage area. I fail to see the advantage of hiding them in drawers. One of these days I need to remove the drawer slides. And, figure out where the other half of the slides is. Actually, they are safely stored in PVC pipes. 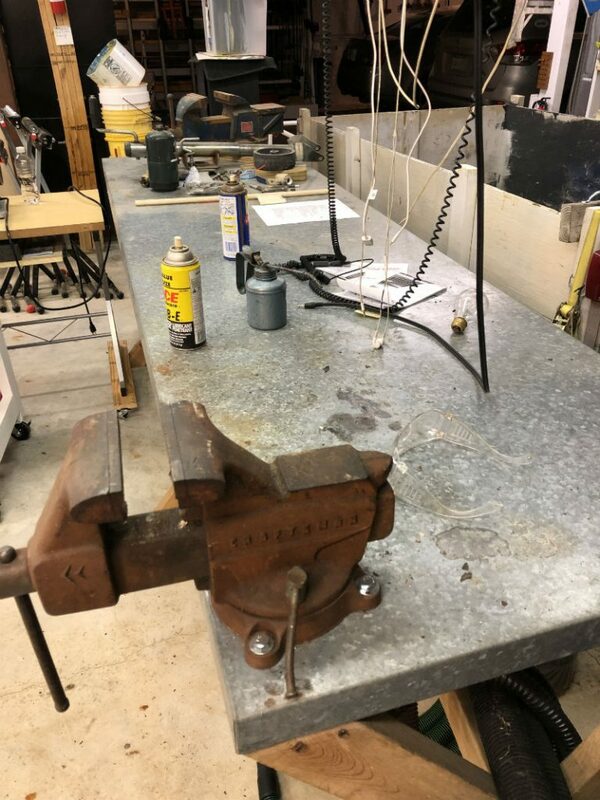 The best thing about having tools on wheels is that the infrequently-used tools can be in a different part of the shop and not clutter the main working area. It’s both safer and neater. 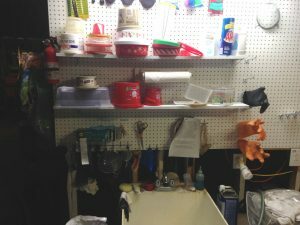 Think of this area as a little farm, a parking area for power tools that can quickly and easily be moved into the main shop area, or can be used right where they are if the task is small and quick. Discarded doors have a million uses. Just as good or better, they’re usually free. Believe it or not, I actually paid for the reject door in this story. As you might imagine, I didn’t pay much. What’s so great about doors? For starters, they’re flat. 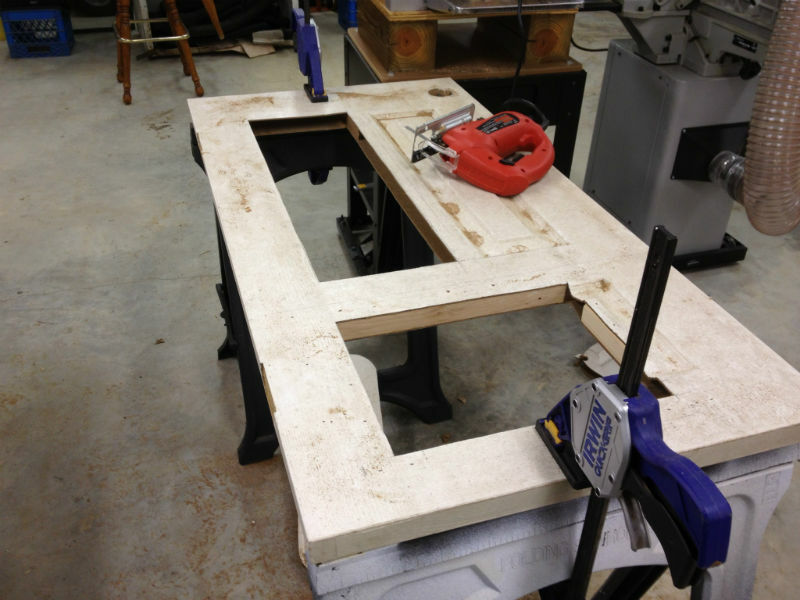 Even a cheap interior door is likely to be reliably flat unless it’s been wet or lain in a garbage pile for a week. What else? They’re pretty strong. In order to stay flat, a door has internal structures that keep it stable. That may be a wooden frame or, in the cheapest of doors, corrugated cardboard on edge. Sometimes a door is even waterproof, like this one I made my sharpening station from. I found this PVC-coated interior door lying in someone’s yard on garbage day. I had absolutely no use for it, but I stored it in the garage at work until the need arose. I’m glad I did! It made the perfect foundation for the sharpening center. 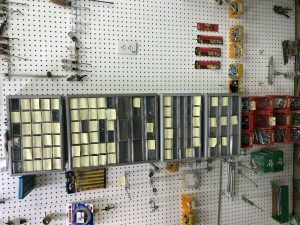 After years and years of using roller stands around my table saw when I had wide and/or long materials to cut, I finally decided I wanted an outfeed table. I built this “table” from a door my work next-door-neighbor had acquired. A Bell Telephone building in Biloxi was being torn down, and my friend got word that there were accordion doors inside. As you might imagine, Ma Bell didn’t buy cheap doors. Although this is only one panel of a long, long partition, it weighs a ton. I asked my friend if I could buy a couple, and he graciously agreed. I took one to a sheet metal shop and asked them to wrap it in galvanized steel. I use it for wet and dirty things that require the surface be protected. This table is impervious to oil, solvents and light banging. When I hired the sheet metal company to encase it, I should have asked the cost. I nearly lost my breakfast when I picked it up! Still, it’s been invaluable. I made the other door into a general working table. It wouldn’t have hurt my feelings if it had been wider, but two together would have been too much. It’s flat. It’s solid. It’s green. Not that green is an advantage of any kind. In fact, it’s kind of ugly, but you ignore it after a while. 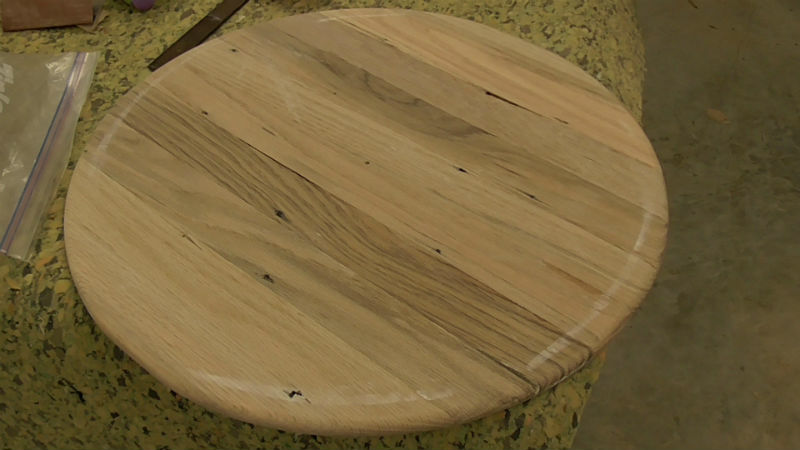 Here is the finished product: my simple outfeed table. I don’t need the table to contain storage, so there was no need to make a cabinet out of it. The picnic-style legs make it extremely steady. Challenge Number One was getting it home to my shop, as it was in the clinic garage. 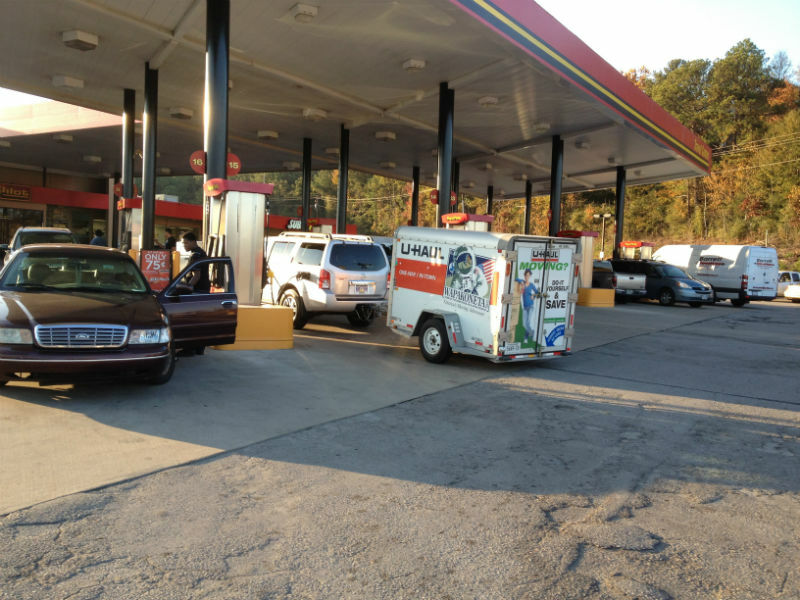 It took three of us to load it into the utility trailer. I put it upside down on a thick blanket. It’s pretty top-heavy and I didn’t want the rough floor of the trailer ruining the door-smooth top on the way home. But, I got home and realized, “Wait a minute. I don’t have any help. 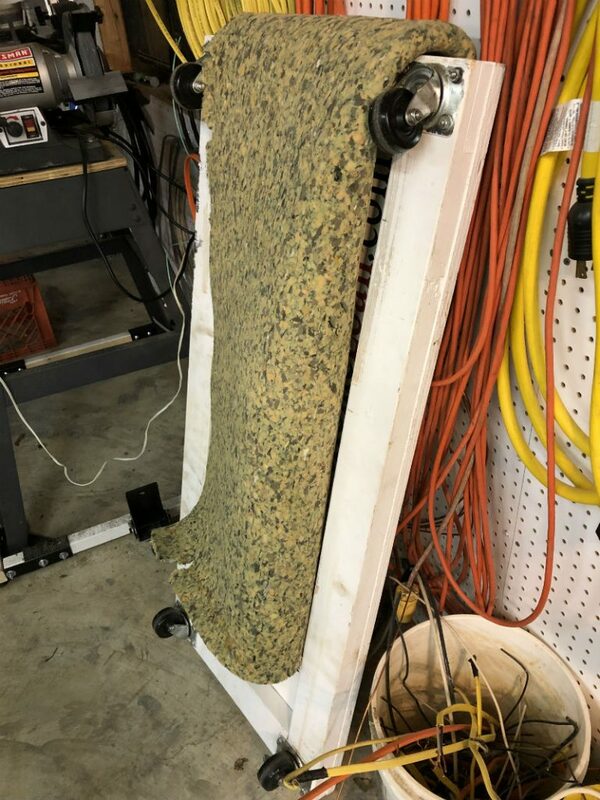 I have to get this off the trailer and diagonally across the garage, around the table saw, past the planer and jointer and into position.” For the solution to that problem, click on this month’s Tip Number Two. OK, now it was behind the table saw. And, it was too tall. Arrgghh! I needed to turn this monstrosity over to trim the legs! I had to keep reminding myself it was free! Regular readers already know I’m into overkill. What I was about to do next is overkill, but with no good justification. 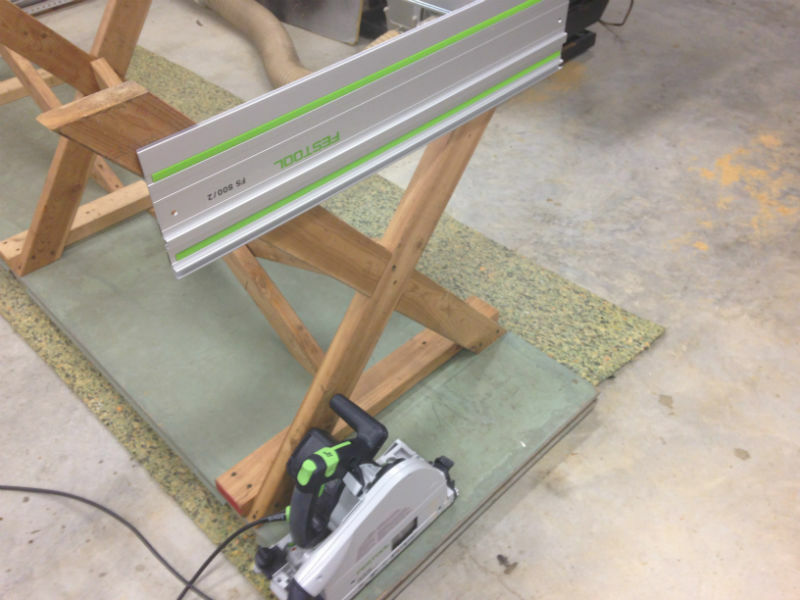 I’d only recently bought my Festool TS 75 Track Saw, and I was dying for any excuse to use it. “Besides,” I thought, “I want the bottom of these legs to be as flat as possible.” With that in mind, I carefully attached a Festool track to each pair of legs and cut. Perfection! Festool TS 75 Track Saw at the ready, track almost in position. These are going to be the flattest, straightest leg feet in the history of shop furniture! 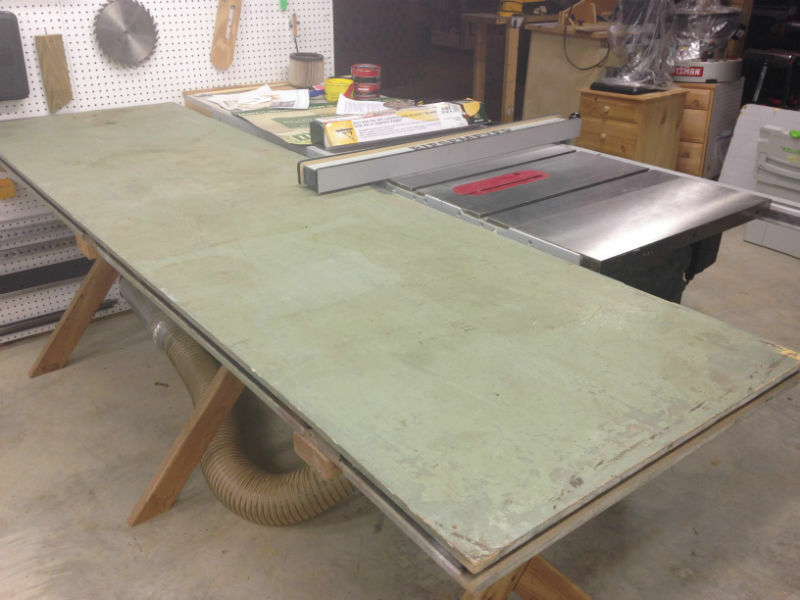 Like most people, I use my “outfeed table” as an assembly table and everything else you can imagine. While I might like it to be a bit wider, the improvement when cutting full sheets of plywood all by myself is incomparable. Although, now that I have the Festool TS 75 Track Saw, I might not be doing that much anymore. You want something free? Well, almost free. If you eat whipped butter, margarine, Cool Whip, or other foodstuffs that come in plastic tubs, you can make use of those tubs in the shop and they won’t cost you an additional dime. Now, if you, like me, don’t eat any of those above items, you, like me, probably know someone who does. It’s not hard to talk them into saving some containers. Probably the thing I use them for most is parts washing. Over the utility sink turned out to be the best place for some shelves to store my “butter containers.” If I need to wash something, there is one close by. If I need the lid, I know right where it is. From cleaning paint brushes to wheel bearings, they’re impervious to every solvent I’ve ever used, which means if you’re cleaning parts in batches you can use the same cleaner repeatedly until it’s dirty. They’re neither air-tight nor water-tight, so you shouldn’t store liquids for the long term. Speaking of liquids, they’re great for decanting from a large container of finish into one you can work from. If you need to go to the door to sign for a UPS package, and you’re coming right back, you can pop on the top to slow drying and evaporation. However, don’t plan to store finishes in these containers; the lids don’t fit securely. Over a short amount of time oxygen will enter and ruin the finish, and, if it falls from a height, finish is going everywhere. These organizers with plastic, see-through drawers won’t break the bank, either. I have screws in one, nails in another, nuts and bolts in the third.